So for week 4 of Luna Jubilee's 52 Weeks of Color - Part Deux challenge, Iron. Iron's easy! Iron is grey! I love grey! But that's too easy. So I made a clever pun. A wonderful, wonderful, clever pun. Ironing while wearing iron! Geddit?! IRON...ing. Uh. Yeah. So. Anyway. 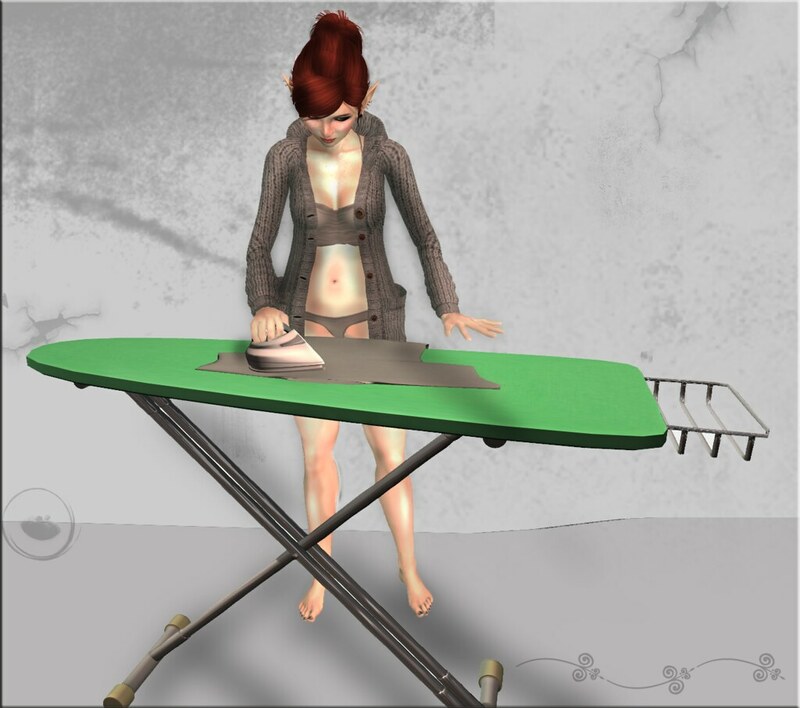 Astonishingly, I found that I had two choices of ironing board/iron (seriously, I'm a terrible homemaker in RL), I went for the RC Cluster one because it had a choice of glamourous clothing items to flatten. While you're reeling from the results of my tough decisions, I'll talk about more relevant stuff, for instance, my underwear. I wear this set a LOT, it's the Simplicity set from Pig, and it's just so beautifully made, while being normal, ordinary underwear. Do Love. This look also showed me how ALREADY, rigged mesh has ruined me. I bought the awesome cardigan thingy from Pivaaca, exactly what I was looking for. But then when I was walking towards my photosphere, I found myself thinking "this cuts through me, tsk". Then, I slapped myself for being so ungrateful. I (just about) remember a time before sculpts, let alone mesh. I'm lucky to have such fantastic clothes available to me. Not everything can be the brand new shiny, and the brand new shiny isn't always the best thing. Given that I still wear some stuff from 2007, I shouldn't be a brat about that sort of thing. But on the subject of shiny! and new, there I am rocking Slink's new mesh bare feet. I like the shape of them a whole bunch, and they were easy to get to the right colour, but I like my feet a bit bigger (like how I have gigantic hands) and it's a sadface that with mesh they're not resizeable, and there's probably very little demand for different sizes. But the toenails are colourable! Yay!